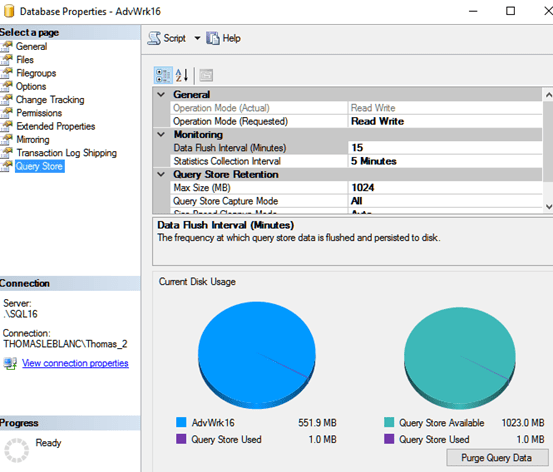 SQL Server’s new Query Data Store is a brilliant option for databases if you are a DBA or have to do performance tuning on T-SQL queries. This new feature of SQL Server 2016 is contained within a database with configuration options for storage of history and query plans. The option has many benefits you can take advantage of today, but also this is an option for future upgrades to new SQL Server versions because of the history contained in the database rather than the instance. To enable the Query Data Store, you have to be db_owner of the database or SysAdmin to the instance. Once you right-click the database in SQL Server Management Studio (SSMS), go to the Query Store menu choice on the left and change Operation Mode (Requested) to Read Write. There are other options to handle the time retention of data as well as how often it is collected. This will enable the database to start storing query execution plans as well as statistics like IO, Read/Write and execution times in the database itself. There are new Data Management Objects (DMVs/DMFs) to use to manual retrieve this data. 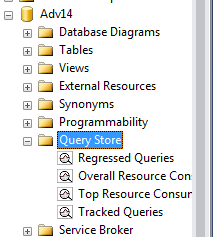 There are also reports available at the database level in SSMS to view information about query statistics. If you drill into the database in SSMS, you will see an option for Query Store. Here, you will see the four default reports that come with this Option. The above is just a summary of what you are able to do, but just start using this feature and you will be amazed at what it enables DBAs and others to drill into. This drilling is just the history of queries on one database rather than you having to sort through all plans for an instance.